Home > My Passion.....Bikes > Hero Honda Sleek, Hero Honda CD Dawn and Bajaj Platina 100 cc. Hero Honda Sleek, Hero Honda CD Dawn and Bajaj Platina 100 cc. A couple of days back got a chance to ride the Bajaj Platina of Piyush and the ride inspired me to write few words about the different 100 cc bikes that I’ve rode. So, let’s start with the Great Grand Father of the three – the Hero Honda Sleek. Note: The figures of all the technical specs have been taken from the November issue of the OVERDRIVE magazine. Let’s begin with the technical specifications. One point note here is that Hero Honda Sleek and Heron Honda CD Dawn share the exact technical specifications as both of them share the same CD 100 SL engine, so I would be mentioning a generic technical spec for both the bikes. When Dad bought this bike in the early 90’s (not sure of the year though) it used to be a show stopper. Where ever my Dad went with this bike, people used to turn around and gaze the bike as we would do if some body crosses us with a 1000 cc bike. I can still remember the smoothness with which it used to cruise through the messy traffic of Patna. With its sporty rear and its smooth CD 100 SL series engine, it had all the qualities by which it could prove every youngster dream bike at that time (remember the tv ad!!!). But then I guess Hero Honda saw some nightmare in broad daylight and stopped the production of this bike and moved onto CD Dawn (which was a replacement of Sleek with the same engine). Well Hero Honda as expertise in ruining its own move – remember what the company did with the original CBZ!!!! Well due to lack of proper maintenance and lack of original spares, the bike is now like a tiered and worn our race horse who’s just waiting for its last few painful days to get over, but even today also, when it goes out for a stroll, it does fairly well. The ride quality has no doubt gone down a lot. I can feel vibes even when the engine is on and the bike is idle. The pickup comes with a lot of effort and the lack of original spares shows its aftermath on parts like head-lamp, horn, indicators etc (with the battery also being a local one). But then also, ladies and gentlemen, the gear box remains as smooth as you can imagine. There’s a lot that needs to be done to make the bike work smooth or at least almost as smoothly as it used to be. But the question here is would it worth the investment!!!! The bike did its job, did its job great and weather not revive it still remains a question of usability and viability. I’m never ever in favor of an entry level bike. The looks of the bike are almost nil, even the features of the bike are almost zilch. If one desires a Hero Honda 100 cc bike then why not go for a Hero Honda Splendor Plus or Hero Honda Passion Plus which has at least an Executive look and some basic features (at least a fuel gauge). Above all having ridden the same engine on a stylish bike like Hero Honda Sleek, it feels a bit awkward to ride the same engine on a CD Dawn (you know……… memories bite more than mosquitoes!!!). As stated above, the technical specs are almost the same as the Hero Honda Sleek since this bike was launched to replace the Hero Honda Sleek, so nothing much to discuss over here. The ride experience of this bike till date as gone as per the Hero Honda legacy, i.e. absolutely comfortable and hassle free (well there’s nothing much in this bike which can give you any sort of hassle). The gear shift is like as if you are operating some kind of a switch to shift gears, it’s that smooth. The power delivery and pickup are also quite smooth. The bike though can go beyond 60 kmph but starts exerting a lot of effort beyond 60 and starts vibrating at around 60. With the absence of a fuel gauge, calculating the amount of fuel in the tank is completely mental math for you. The fuel efficiency that the bike offers could suite the pocket of your entire dynasty. If you are looking for a bike which has a CD 100 SL class engine fitted over a tube chassis, with a smooth gear box, fuel tank, indicators, head lamp and a seat screwed on to the frame, the CD Dawn is the bike for you. All in all even though it’s a good commuter’s bike, it’s not an Executive Class bike. Frankly speaking I really didn’t liked the way Bajaj promoted this bike (with the Himesh Reshamiya back ground score – just hate him) and going with the Bajaj legacy of under-performing 100 cc bikes, I had a level of prejudice about this bike being a crap. But when I rode Piyush’s Platina, then I came to know how wrong I was. So, if we go by the above figures, the CD Dawn beats the Bajaj Platina on the performance and fuel efficiency fronts and therefore the CD Dawn comes out as the winner. Now if we talk about the ride experience, it was an AHA moment for me as I never expected a 100 cc Bajaj bike to be that smooth. Even the gear box, ladies and gentlemen, was as smooth as the CD Dawn, no hassles at all. The engine note also was quite soothing and throttle response was also crisp. The pickup was also good for 100cc bike and this was very well complimented by the gear shift. At fourth gear (even though I didn’t had much opportunity to take this bike at fourth gear for a good time) the bike seemed to glide all by itself. The front shockers and the rear dampers (with twin springs) were magical on the pot holes of Patna. I was able to take the bike up to 55 kmph and there were no vibes at all at that level, which is again great. The left/right indicators make ample noise to make you know that they’re blinking (which always reminded Piyush to ask me from behind to turn them off. Sorry dude I’ve the self canceling ones on my P200, so I’m faulty of having the bad habit of letting the indicators on their own).The greatest thing which I loved was that neither Piyush reported any Kick Backs neither I experienced any, which is a very irritating menace in my brother’s CD Dawn. Apart from the differences in performance and mileage, I guess the Bajaj Platina is much better package than Hero Honda CD Dawn. But again the competition of Bajaj Platina could come from the likes of Hero Honda Passion Plus, Hero Honda Splendor Plus which were the Executive Class 100 cc bikes available at the time my brother decided for Hero Honda CD Dawn. If I go into the details, the post would become as long as Arabian Nights, so I’ve summarized the specs of the three bikes under, but the bottom line is that the Indian commuter class never had so many options as he has today and especially from Hero Honda, which produces a complete fleet of 100cc bikes. So, from the above comparison we see that in the Executive Class 100cc bikes, Bajaj Platina has a clear edge over the offerings from Hero Honda. Though Hero Honda recently revamped the looks of the Passion Plus and made it more desire worthy, but the specs remain the same and that’s where technically a Bajaj Platina races ahead. If we can blindly praise a Japanese R&D product then why can’t we give a chance to a product which has been developed completely in India, because at least technically it’s proving to provide better performance and reliability than the Japs. So, my fellow bike commuters, there’s no harm in giving Bajaj Products its fair bit of chance. But it’s already too late. 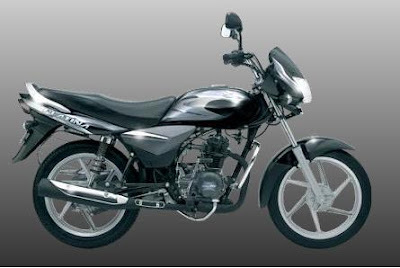 The blind following of Hero Honda has forced Bajaj Auto to call off all its 100cc bikes and that I think is a very unfortunate decision because after having ridden the Platina, I think it was a dam good bike in its class. Yep.. the "Sleek".. India's first Stylish Bike.. I still vividly remember the TV Ad where a dude practices guitar riffs and then smoothly takes the "Sleek" on a ride.. I took platina just by going through overall performance and cost. Yaar itni gehrayi mein kabhi gaya hi nahin. Acha laga ye jaan kar ki tujhe acha laga. Also, thanks for giving such vivid description. Now, I will recommend your blogs to those who condemned me for bying Platina. i still own a Hero honda sleek sl 100 in original paint scheme and a front tyre with markings May 90. I am able to squeeze 70 kms from every litre of gas. This bike just refuses to fade into oblivion. I have now decided to give it a fresh coat of paint and a new multi reflector for the headlamp. I am sure my bike will celebrate its silver jubilee! I need Heero Honda Sleek cowl & his chesis part. Where to purchase..? please guide me.